Over the weekend we received these photos from a patient. Aside from the fact that these are great quality before and after photos – consistent angle and lighting, having the foresight to take a ‘before’ photo to compare to her ‘after’ photo – they also point out something very important. Sometimes, it’s necessary to stage cosmetic procedures. 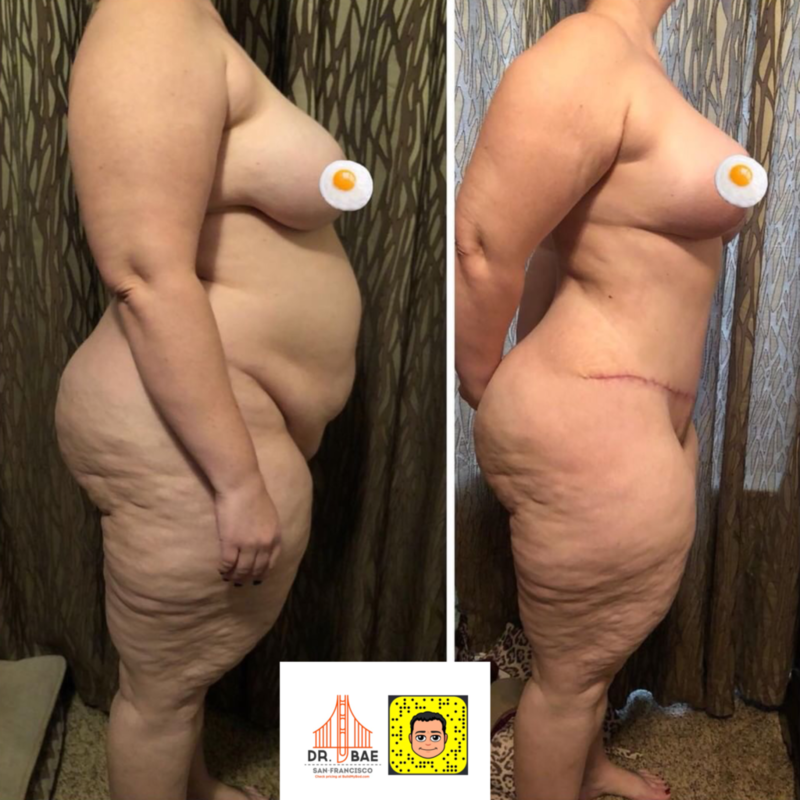 As these photos demonstrate, she looks great after her Mommy Makeover that included a breast augmentation and lift, back liposuction and tummy tuck. But she’s also concerned about her thighs. However, we didn’t try to address this issue in the first stage. There are certainly benefits to doing “everything” at once. This can consolidate a patient’s recovery. Rather than two recovery periods, there is just one. However, there are safety concerns as well. Whenever we perform liposuction, we take about 5 liters at any one time. The concern with taking more than 5 liters at once is a severe form of dehydration termed hypovolemic shock. But even if your doctor tries to avoid taking more than 5 liters in one operation, they can remove 5 liters in each stage. This patient had about 5 liters removed in her first stage when performing liposuction of the back and abdomen. If we tried to treat the thighs at the same time, that 5 liters would’ve been spread out over the back, abdomen and thighs, thereby taking less fat from the back and abdomen and leading to a less dramatic result. She chose to stage these procedures. Therefore, we took 5 liters from the abdomen and back in the first stage, And plan to take another 5 liters from the thighs. While this requires two operations, it will lead to a much better result than what could be achieved in one operation. To check pricing on a Mommy Makeover from a doctor near you, click here. This entry was posted in Procedures and tagged mommy makeover, mommy makeover cost, multiple procedures by Dr. Jonathan Kaplan. Bookmark the permalink.